SQL database is widely used on the Internet. Whether it is a simple website, online application, cloud, or online service, all use SQL databases to manage their data. Apart from the online use, SQL database also has applications in software and other offline tools as well. A database has various groups and entities with primary, private, and/foreign keys. These keys are essential for the communication between the datasets/groups. With all the datasets, entities, and keys, it is hard to keep track of everything so making a database diagram is the most ideal solution. A SQL database diagram is a structure of its datasets, that represents how data is organized and how the relations among them are associated. Now, making a database diagram can be easy and hard depending on how you are making it. There are many online tools out there where you can make database diagram either by drawing each dataset and relation or by creating separate group for each dataset and then defining relations among them. This doesn’t sound easy and fast. In this article, I covered a free online database diagram maker where you can make SQL database quickly. 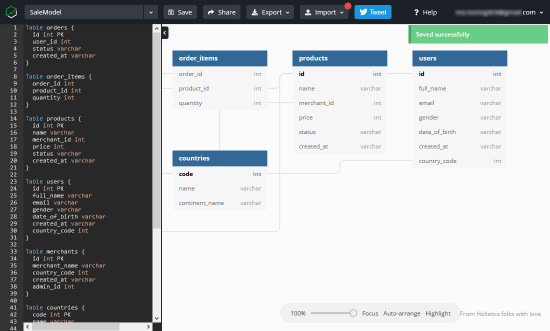 In this editor, you don’t have to make groups or draw anything, all you have to do is enter your SQL data and it creates the diagram for that. dbdiagram is an online database relationship diagrams design tool. It is an easy to use tool to make SQL database quickly. This tool has a simple user interface with a large canvas area along with a data input panel on the left and other options on the top. To use all the features of this tool, you have to be logged in. You can log in with your Google account here. Now, making the database diagram is very simple here. You don’t have to deal with drawing tools or have to create tables etc. Simply enter the SQL database in the input panel. The syntax is simple; you can use most of your SQL database code here. You can create tables and define the entities within along with their types and primary key. 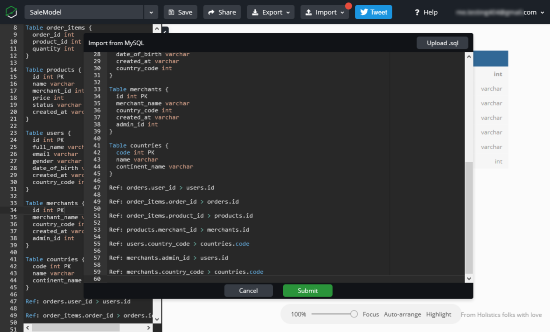 This tool highlights the errors in the code and gives suggestions for corrections. As you give an input to this tool by either method, it instantly creates a database diagram for your data. The diagram is interactive, you can move tables around and change the zoom level either by mouse scroll or with the zoom scale. Focus: Brings the zoom level to default and displays the entire schema when clicked. Auto-arrange: Automatically arranges all the tables in a hierarchical order. Highlight: Highlights the connection between the datasets when you hover the mouse cursor over it. Make database diagram online with dbdiagram here. dbdiagram is a handy tool to quickly make database diagram online. 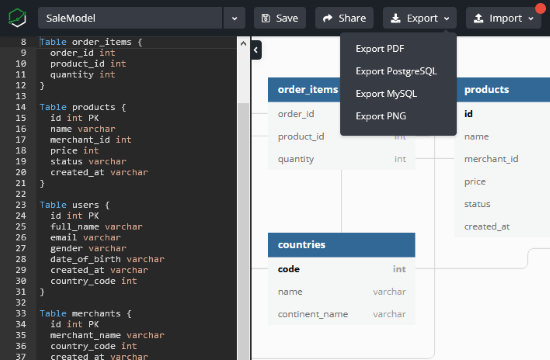 Whether you have MySQL data, PostgreSQL data, or working with Rails(schema.rb), you can easily import that data here and make a database diagram within a couple of minutes.